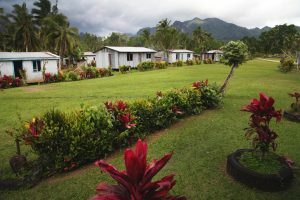 This is a guest post by Lindsay Clark, about her experience of volunteering in Fiji and what she learned in the aftermath. Yes, but we asked the community what they wanted and delivered only that: English classes, the basics of sports medicine …and then First Aid and then hygiene and other stuff we knew [and they “needed”]! You see the trend. The defense. The fragility. The implications. And the struggle to understand what was really going on. The struggle to absorb a lesson that goes counter to everything I’ve ever been led to believe: about how to exist in the world, about the way to live, about myself. I hope you can see it. If not, let’s talk. That was my thinking back in 2010, halfway through a two-month self-initiated service project in the interior of Fiji’s main island. I built a wall around myself with those thoughts while talking to a fellow traveler at a beach bar, one of the many times I came down from the rural Highland village to use the wifi. This man—an eavesdropper to the conversation I was having with the Fijian bartender—offered me a gift that I couldn’t appreciate until years after I left the South Pacific. He waded into our conversation with a kindness I didn’t deserve, given my exasperated tone that all my efforts were landing flat, “one step forward and two steps back,” not making the kind of “progress” I expected in two months. He spoke of “we,” though I saw myself apart from colonizers, past and present. He spoke of “they,” not knowing those 300 village residents but knowing them in concept enough to know the age-old score. They being people that already used soap in every necessary context, about as diligently as my home population. They being a community that politely accepted my offer to live with them for free in exchange for my teaching services, my transported medical donations, my good friggin’ will. It didn’t feel like it at the time, but I was lucky to meet this guy. He was the first person to introduce the possibility of imposition. He ventured into contentious territory questioning the premise of something I had been financially and emotionally committed to. He gestured towards my ethnocentrism, and I considered it for the first time, as if a fish discovering water. That poked hole launched the start of a decade-long perspective shift. He exposed the weakness of my worldview, but it took years to diagnose. I started reading up on Fiji and international development. Only with time did I feel comfortable telling my Fiji stories, and it took even longer to tell them the way they needed to be told—incorporating more than my bruised perspective. And for years I struggled to accept the possibility that my good intentions inflicted emotional violence on members of a community I loved. Perhaps even a financial burden or the threat of legal or diplomatic turmoil. I tried to fit my hasty exit from that village into my narrative that there were a “few bad apples whose greed ended our otherwise promising initiative.” I replayed in my mind the arguments, the deception, the drug abuse, the physical abuse, and I chalked it all up to the actions of others. Because I couldn’t accept that I could possibly be like them: the white saviors. The ones who imposed and assumed. The ones who regarded themselves higher than others. In my limited view of this insidious complex, there was no spectrum. But then something knocked me out of my ignorance. 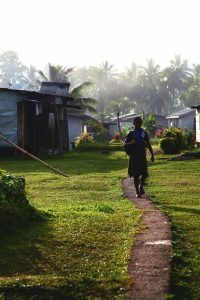 Five years later, I went back to this community in the beautiful, forested Highlands of Viti Levu. I called the elders, asked for permission, negotiated room and board, booked a flight, and rode the creaky carrier up twenty-seven kilometers of mountain road to encounter my past self and the lives I impacted, one way or another. That return was clouded with extreme emotions, root causes of which I couldn’t define. I saw the kids I taught, their same sweet faces now on much larger bodies. And I saw the people with whom I had disagreements, the people I feared, the people who felt wronged by me. We shook hands. We spoke about our families. And we found ways to address our past mistakes and move forward from them. It didn’t take long, because as they reminded me, the sun sets and then it rises, after all. When I started the project, I believed I was conscious of the important considerations when conducting service abroad. I was invited. I had a local liaison to help me understand our utility and bridge the language gap. I reacted to their stated needs. I met with elders and had plans approved. I prioritized informing the community rather than banking on word of mouth. I arrived open to any suggestions of how I could be of service. Yes, but as life took over and all our norms were challenged (theirs and mine), I went to a protective and judgmental place. I saw right and wrong starkly. I trusted some gut sense of justice that didn’t consider the local perspective. I started separating myself to feel like myself. Yes, but I needed to be aware at all times how my actions could be interpreted. How not wanting to eat chicken feet or not prioritizing the acquisition of Fijian language would imply I thought both weren’t worth my time or taste. Yes, but I needed the right liaison who could be honest about those power dynamics, someone who could see what I was missing, someone to clue me in to the fact that Fijians often pay lip service out of politeness, even when asked for honesty. Yes, but I needed to be aware of how my relationships with liaisons could influence their sincerity. The more opportunities I provided, the more they had at stake if my plans started to crumble. Yes, but I was ill-equipped to perceive how my whiteness would work for and against me constantly. “Wear sunscreen, you’re not cooked yet,” I would hear in jest, “we’re already cooked.” For some, my whiteness implied intellect, stature, and wealth. It also implied physical incapability and sexualization. I was babied and venerated, bubble-wrapped and disregarded. And because I had the privilege of sidestepping considerations of race up to that point in my life, it came as a major surprise. I always wanted the treatment I wasn’t getting, and I never knew the cause for any effect. Fiji was the biggest test of my humanity, but understanding what happened in Fiji has been the most valuable lesson of my life. I’ve since replaced my fragility and ignorance with a hunger to learn and to share, a breakthrough only possible with the acceptance that I am in constant evolution. Books like Learning Service have helped me uncover the greater narrative of which I was unknowingly a part and to what extent our society encourages such behavior without question. The dominant perspective of our society will support these missions without question. But they should be questioned. We should question our own intentions, question our friends to make sure their intentions are producing the intended impact, question how we speak about other cultures, question schools and NGOs and governments about the local support for their programs. We should teach about all these considerations in the classroom, and we should consider ourselves lifelong learners beyond. When my project soured almost ten years ago, one family extended themselves immeasurably to help me recover and move forward. To this day, they are my umbilical cord to Fiji. Without them, I couldn’t have rectified this burning memory. I wouldn’t have returned nor felt welcomed to. They are why I’m capable of a path towards knowledge and growth. And I found my means of seeking accountability through writing a memoir meant to honor the community the way I should have from the start. With the elders’ awareness and in consultation with its citizens, I’m now taking the time to critically investigate the experience I manufactured, to cautiously represent a culture that is not my own, and to create an artifact of which its own citizens would be proud. The book will advise other hopeful humanitarians against similar actions, but it’s my hope such a message will be a drop in an ocean of thought and literature by that time. We can’t blindly trust (nor doubt) the systems in place related to service opportunities. We can’t expect them to have done the moral lifting already that will align with our values and, more importantly, the long-term needs of the local community. And we can’t be afraid to admit that perhaps we are capable of actions we once thought beneath us. The sooner we discover the water around us, the sooner we commit ourselves to doing actual good. Lindsay Clark is a writer, videographer, and former international educator who blogs at Nomadderwhere.com. She is currently writing a memoir about her time in Fiji, for which she will pursue traditional publication. In her spare time, she bakes sourdough, travels, and enjoys the nature surrounding her new home of Denver. 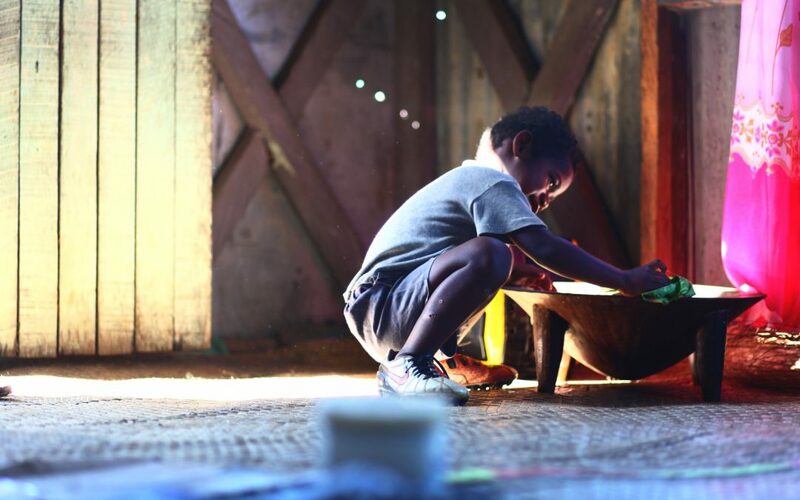 The featured image is of Paulo mimicking his father cleaning the tanoa, or kava bowl.